I've written about fold forming on this blog in the past and noted several good online tutorials found on Charles Lewton-Brain's site, at ganoksin.com and on Rio Grande's You Tube channel. I've been fold forming metal for many years and I just love the annealing, quenching and banging rhythm I find in the midst of this work. 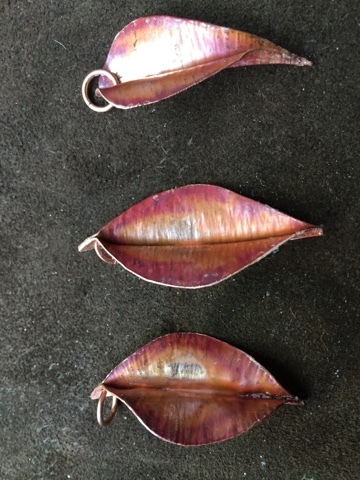 Last week, I decided to fold form a series of charms for sale at upcoming shows. 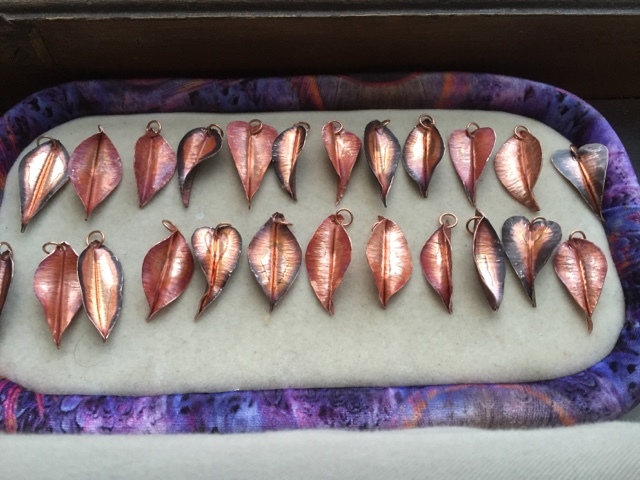 So I took a sheet of 6" x 6" copper sheet I bought at Beadfx and divided it into 24 1" x 1.5" pieces. Then I folded each one in half lengthwise. Next, I drew a shape along the piece in one of three shapes: either narrow at both ends, narrow at one end or a heart shape. Then I forged some of them along the table, or fold edge, and others I forged along the open edge. Then to change things up a bit I tried something I learned from Mary Hettmansperger - I fluxed some of them with spray flux and that kept the firescale at bay and showcased the gorgeous reds and oranges that come out to play along the surface of copper sheet when it's quickly heated then quenched. All of these leaves were fluxed. The one on top was wide at one edge and narrow at the other and then forged along the open edge. The middle leaf was cut narrow at each end and wide in the centre then forged along the table or closed edge. The bottom leaf was cut like the middle but forged along the open edge. But I wasn't done yet! I had to pry each piece open, file the edges and hole punch each one. The final step was to polish each one with Renaissance Wax to seal the patina. Here's a group photo. The leaves that weren't fluxed are distinguishable by their dark edges, which is firescale. 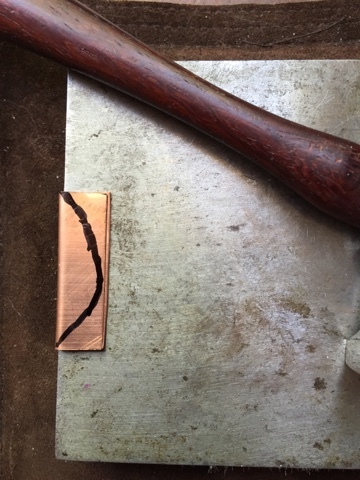 If you want your pieces to be bright copper, then pickle them before sealing. It took me quite a few hours of work to create these beauties but they were well-worth the effort, IMHO.